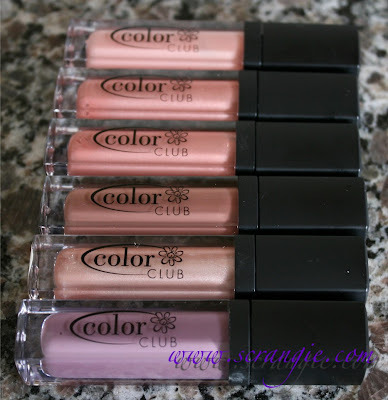 Have any of you ever tried Color Club's lip gloss before? I hadn't until just recently, though I've always been curious about it. I think I first noticed that they had lip gloss when the Wild at Heart collection came out, and the pictures on the press release included some sweet duochrome looking lip glosses. I never ended up trying them (no one seems to sell it!) 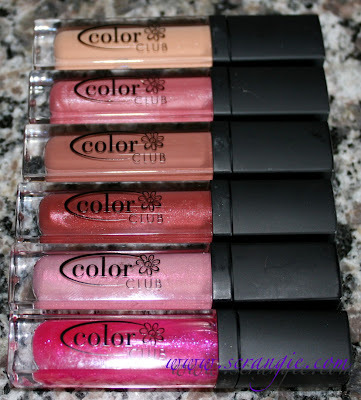 but just recently Color Club sent me a bunch of their lip gloss colors to review. And I can't remember ever seeing a review on it before, so hopefully this will be a good reference! 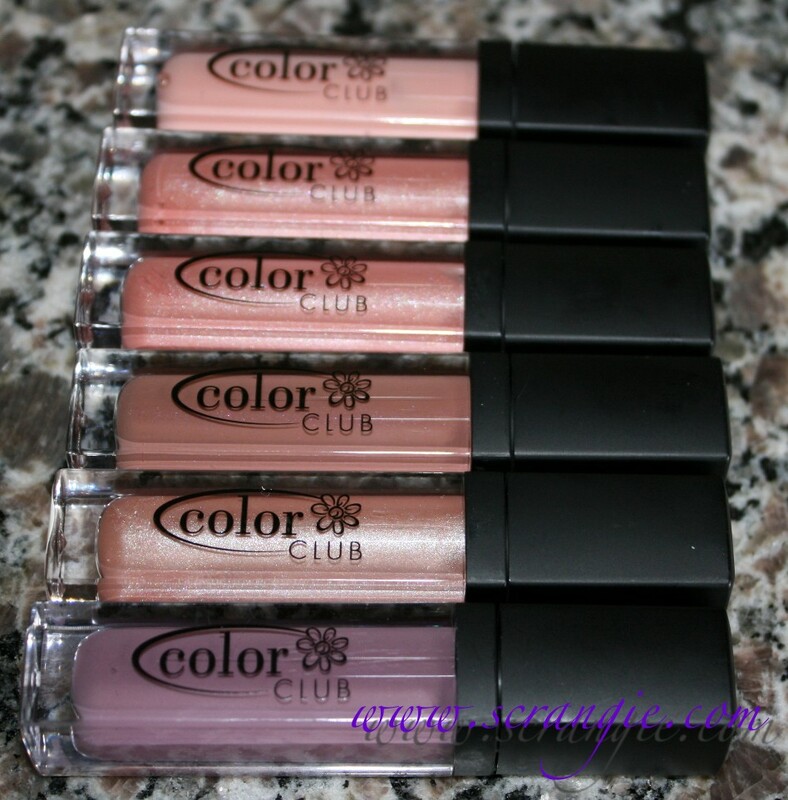 You can view the current Color Club Lip Gloss lineup here on their official store. 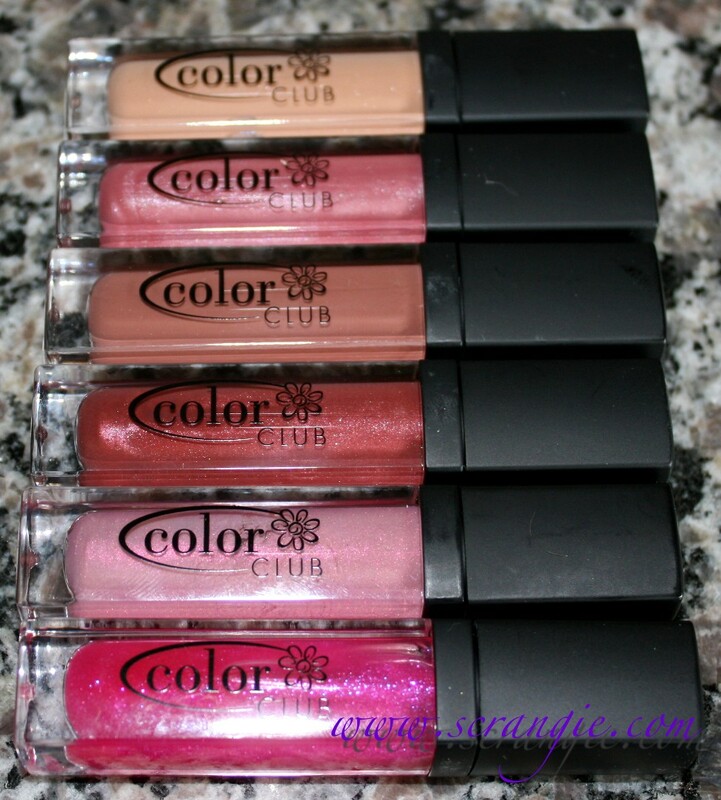 They currently have 38 shades available for sale on Shop Color Club. 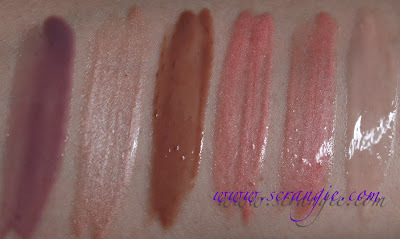 Top to bottom: Naked Ambition, Ms. Popular, Classy Mama, Pretty Please, In Vogue, In Disguise. With flash and without (enlarge to view detail): In Disguise, In Vogue, Pretty Please, Classy Mama, Ms. Popular, Naked Ambition. Top to bottom: SWAK, Sugar On Top, TuLIPS, Ultra Sweet, Diamond Dust, Style Icon. With flash and without (enlarge to view detail): Style Icon, Diamond Dust, Ultra Sweet, TuLIPS, Sugar On Top, SWAK. 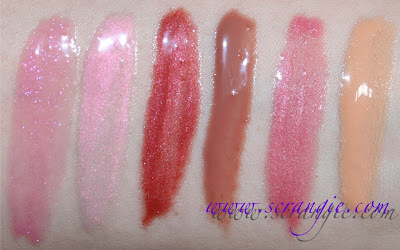 Top to bottom: Vamp, Spell On You, Red Dress, Sparks Fly, Citronic. 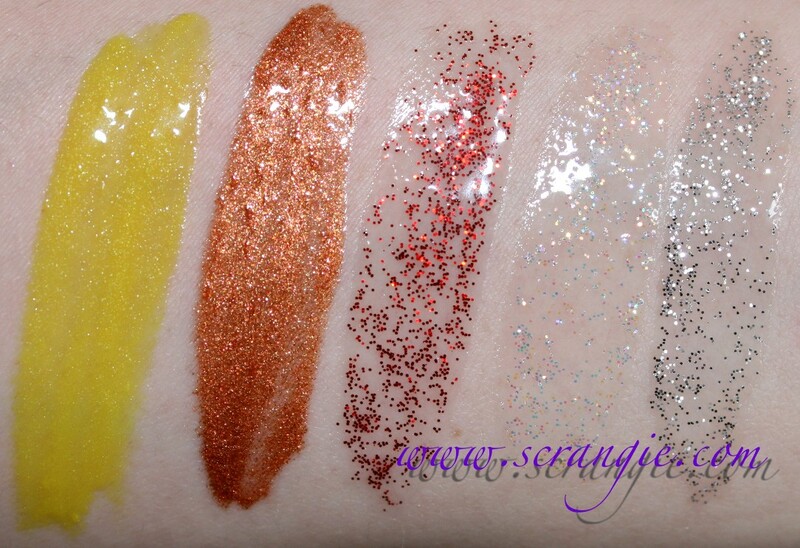 With flash and without (enlarge to view detail): Citronic, Sparks Fly, Red Dress, Spell On You, Vamp. The formula on the Color Club Lip Gloss is decent. It's thick, slippery and balm-like as petrolatum-heavy formulas tend to be (think Vaseline). I don't have a list of ingredients handy, but from the scent and texture of this formula, it has either a good amount of petrolatum or mineral oil in it. Apparently I've neglected to photograph it (how did I forget?? ), but these have the standard fuzzy doe-foot wand applicator. The tubes are clear, square-shaped/edged and have a matte black plastic cap. I've seen this exact tube somewhere before but I can't place it. Is it NYX? Some other brand? 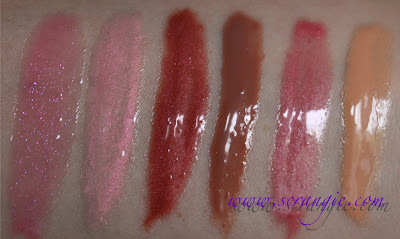 The glosses are unscented and unflavored. They do have a base gloss taste (sort of waxy or lotiony), but other than that, no specific smell or taste. I do wish they had some sort of scent as I never reach for any of the unscented glosses I own because they're not as interesting. They don't wear very long due to the slippery, non-sticky formula, but they don't leave any sticky residue, either. The color selection is pretty good. They have a lot of mature, kinda boring/bland mauves and browns but they also have a good proportion of fun colors, too. My favorites are: Sparks Fly, In Vogue, Style Icon and Spell On You. Red Dress looks awesome over red lipstick, but the one day I wore it alone, my friend said it looked like I had a disease! 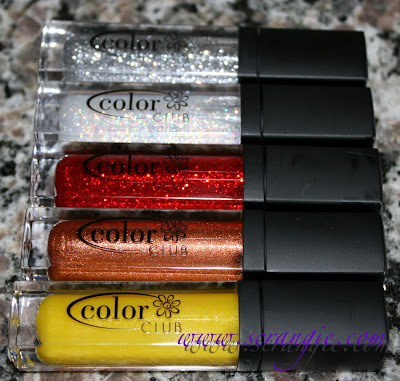 The glitter in the glitter shades is rather sparse, so it looked like my lips were covered in red spots. 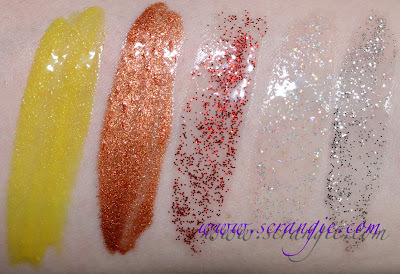 They're very nice for layering, but I think Spell On You looks great by itself since it's a clear opal glitter. And Sparks Fly is just crazy awesome metallic bronze with glitter and a bit of duochrome. Cool duochrome and glittery colors. There's currently only one place I know of where you can order these, so they're really not easy to get your hands on if you don't like ordering online. 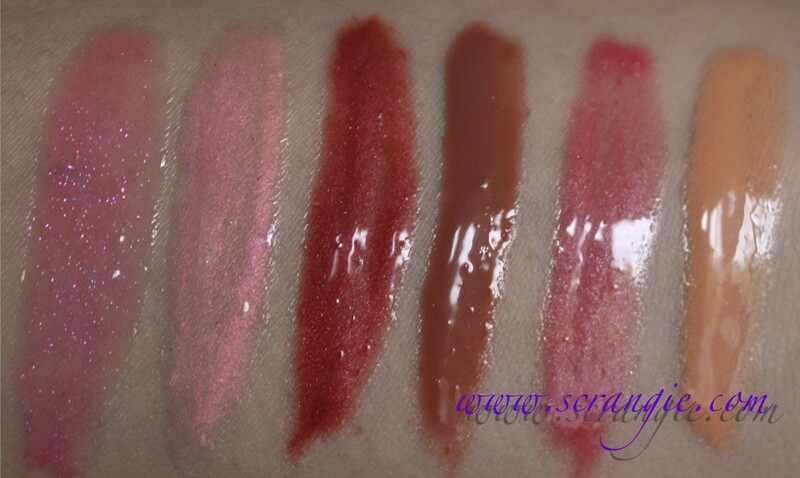 $10 a piece seems steep for an unscented, mineral-oil/petrolatum based gloss. Some of the colors are too run-of-the-mill/bland (think frosty pink and mauve). They're unscented, which is a downside for me, but a plus for others. 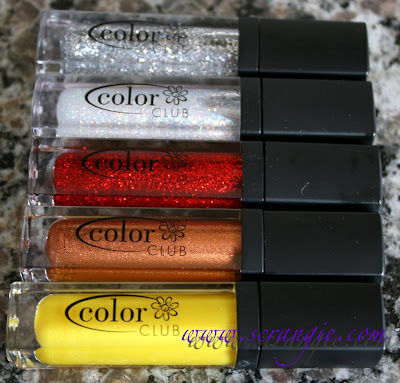 As mentioned above, these are available on Shop Color Club for $10 each. They're currently running a promotion where if you create your own nail polish three-pack, you get a free gloss. I didn't even know they had gloss! WANT! Yeah $10 is too much for these! 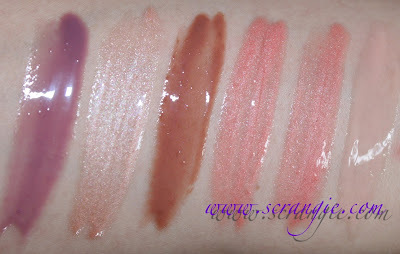 The yellow and lilac look so interesting, I wonder how these look on lips? NYX and ELF both have glosses in this same packaging. In Disguise & Style Icon look really pretty! Wow, they look very pretty! 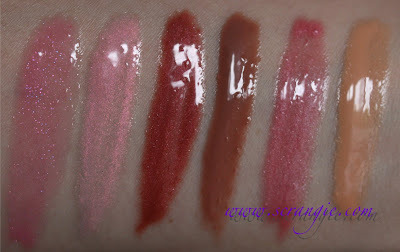 Do you think you could take a few pictures with the glosses on your lips? Just so we can actually see how it will look like. Thank you! 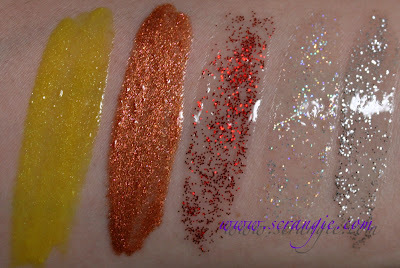 Argh, now I want Sparks Fly so much... /gloss addict with no money. Nice colors, way to high price! Thanks Scrangie! Oh the yellow is BONKERS. I kind of love that! I, too, prefer lightly scented lipglosses - I'm hanging on to the dregs of a Dior lychee-rose KissKiss gloss just for the smell...and a handful of shades from the apparently now-defunct Tony & Tina. Saaaaad faaaaace. 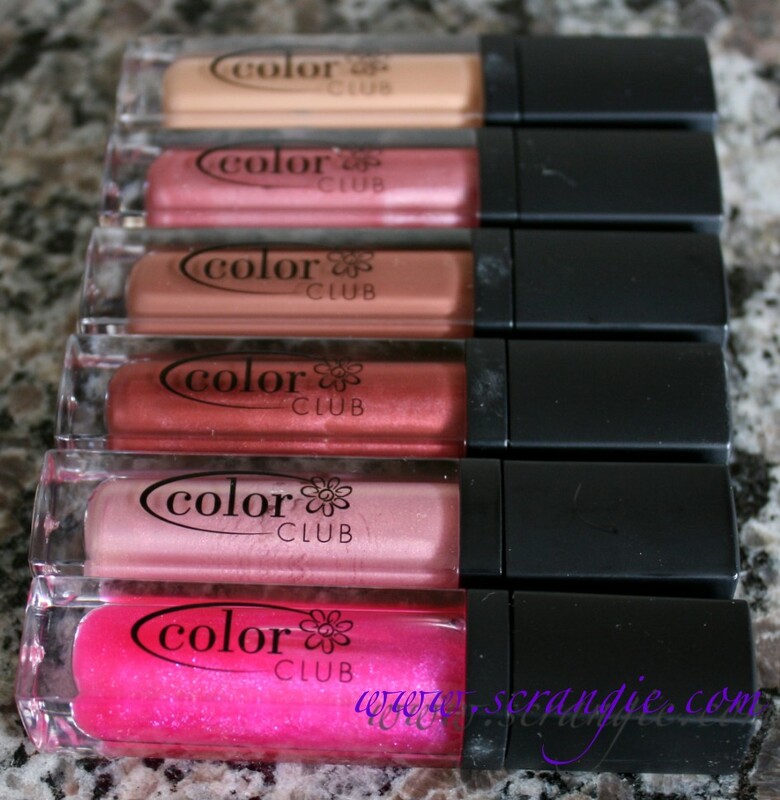 They look like the newest ELF Studio Line glosses. 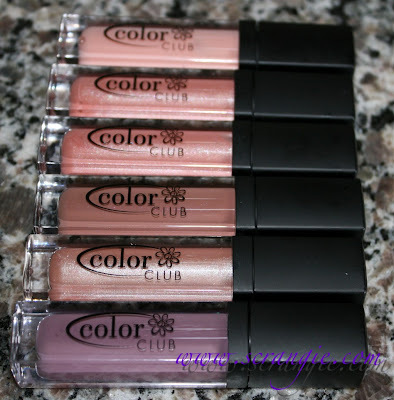 I guess I never paid attention because I didn't even know that Color Club had lip glosses! When I first saw your post, I thought that maybe they had created some smaller bottles for their polish. The packaging does remind me a lot of the NYX ones. Looks like they have plenty of different colours to choose from, but I think that $10 each is a bit pricey. Really like Style Icon! And I even like the matching shade for polish...hehe. Really lovely and great swatches! I know it's a completely odd shade but I have my eyes on Citronic. It looks so cool! It looks like it has nice coverage - does it really give you glossy citrus yellow lips? Oh, I'm such a nerd for polishes I hadn't even noticed they made other products as well. I like the sparkling Spell on You and Vamp. Those tubes are identical to some (IIRC) no-name ones that Five Below had last year. These look nice, but for $10? No way.